Monorail executives say the projects could boost the capacity to 6,000 riders per hour each direction, because faster loading would help trains to depart every three minutes. 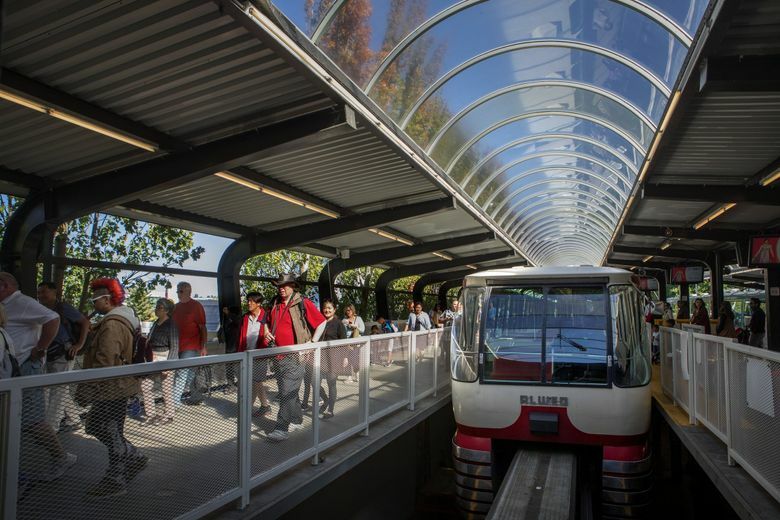 The historic Seattle Center Monorail could double its passenger flow by adding fare scanners, ticket machines, walkways, stairs and wider boarding platforms, a new city report says. Cost estimates released Tuesday say “phase one” can be built for $3.8 million at Westlake Station and $3.1 million at Seattle Center, just in time for the Oak View Group to open a rebuilt arena at Seattle Center for NHL hockey in fall 2020. Although the Seattle Center station has ample room, both stations need rewiring so that ORCA fare cards or monorail tickets would open fare gates, similar to how they’re used at Washington State Ferries, said Megan Ching, general manager for Seattle Monorail Services, private operator of the city-owned system. The company must prevent fare evasion to meet its requirement to break even or profit, she said. As The Seattle Times previously reported, the Westlake Center station is too cramped, so the plan entails removing a retail kiosk and a ticket kiosk from the passenger lobby over Fifth Avenue, so people can move quickly to or from all eight train doors. At Westlake, a $9.2 million second phase, maybe in 2024, would add a walkway, stairs and elevators that wrap around the southeast corner of the mall, leading directly to the Sound Transit subway, where travelers could hop a train between Westlake Station and Federal Way, Redmond or Lynnwood. Monorail executives say the projects could boost the capacity to 6,000 riders per hour each direction, because faster loading would help trains depart every 2.5 minutes. This assumes ideal, uninterrupted operations. Besides using ORCA fare cards, riders could scan event tickets whose bar codes include prepaid fare. One obstacle is funding. None is identified yet. And the arena’s environmental studies presume current stations will suffice, with fewer than 700 postgame fans departing via the monorail in the near-term. The city’s announcement Tuesday speculated that garages near Westlake Station would collect $5 million per year more revenue from people who park-and-ride by monorail, helping reduce event traffic near the arena by 1,250 vehicle trips. The 43-page analysis, by VIA Architecture, also mentions that a Belltown station could be built for $40 million, not including land and engineering, midway along the one-mile route. The monorail was built in 1962, and endured multiple crises last decade — a fire that required passengers to be rescued by ladder, a crash where trains wedged together, a $4.5 million expense for major train renovations, and an unbuilt 14-mile monorail proposal that would have demolished and replaced the old trackways.